People ask me all the time what is the best blender and food processor to use. one neat machine that does it all- the Thermomix is the way to go. 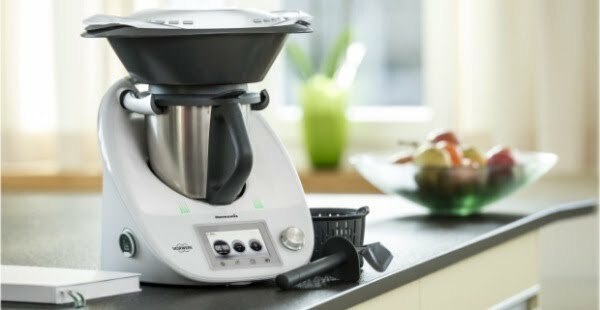 THE THERMOMIX HAS NO EQUAL ON THE MARKET! This machine needs to be seen, to believe! Its not just a blender...but every woman's dream. Its just like having an extra pair of hands in the kitchen. While it is a fantastic blender and food processor, this unique little unit cooks,steams,chops,grinds,mills,minces,purees,weighs,juices,kneads,beats,grates,whips, makes frappés, sorbets, icecream and even lattes.....and then cleans itself! That means this one of a kind kitchen appliance replaces your juicer, food processor,cake mixer ,scales, rice cooker, steamer,crockpot, bread maker, bamix, coffee grinder, mincer, blender, timer and kitchen scales! Just imagine the room you will save in your kitchen cupboards! Not to mention the savings on your shopping bill as you get back to the basics and prepare home made condiments, sauces,pasta sauces,from general household ingredients quick and efficiently! Not to mention one bowl does the lot, which meas less cleaning of all those appliances at the end of the day. There is no doubt the Thermomix will save the average family $40 per week in the shopping trolley! The thing that set the Thermomix apart is its Reluctance motor! This kind of motor works on magnetic fields, no belts or brushes, no moving parts to wear out. This means the motor has an unlimited life expectancy, I like that idea after going through 7 blenders in 10yrs! Check out how the average family could save $40 pw which is a whopping $11,000 in 5 years -here! Restaurants and Cafes are embracing the Thermomix!